Liam Neeson. How to contact the great man, that's this morning's question. He has a little something waiting his attention but he possibly doesn't even know about it as yet. His agent surely owes him this opportunity? I wonder what he'd make of it? Liam that is, not his agent! So I'm sat outside having my Bran Flakes this morning and the bees flitting around the newly planted flowers grab my attention. They go over and over the same path and then will rest suddenly, or is that when they're doing the business end of their reconnoissance? I guess so. For me, one of the best things about Waggle Dance is the set up you can put in place in the early rounds. Extending your bee population, or your hive makes sense but you don't want to miss early opportunity to collect pollen if your opponents aren't able to, and maybe the Queen Bee Cards will bring you a huge favour early too, who knows? In the mid-game the pollen collection is what it's all about and having some good Queen Bee Cards by then is crucial. And it could well be time to restructure the hive or pick up the odd piece of pollen to ensure you've not wasted any. All that honey needs producing; I bet bees are efficient little buggers! The kickstarter campaign for Waggle Dance started with a real flourish and on the back of the UK Games Expo I expected this to then take off even further. It's choogling along quite nicely but needs a little helping hand. Just like the bees. We need to give them a chance, hence the Hora garden having more flowers this year, and we've left the sage to flower with it's beautiful mauve stalks that the bees have been going crazy over for weeks now. So, for an outlay of £22 you get a copy of this lovely game, delivered. 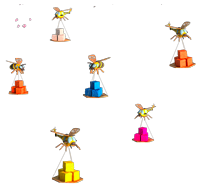 You help a small Cornish publishing company with their second game, and they've also put together a ton of info on bees on their website, a fascinating study in itself. Another level among the kickstarter pledges is the one just for Liam. His own special opportunity to assist. That's why we need to find him, urgently! !